The controversy between Kosovo and the US on the customs tax imposed on Serbian products is growing, as no side seems willing to back down. Washington threatens to impose sanctions on Kosovo if the government does not abolish the 100% customs tax it imposed on 21 November 2018 on Serbian products. The US embassy in Pristina refused to provide entry visas to Kosovo Prime Minister Ramush Haradinaj, who had previously been invited to the White House to participate in the standard annual breakfast prayer. This move is seen as a form of political sanctions and states the US’s intention to proceed with tougher measures if the customs tax is not abolished. Haradinaj has confirmed the pressure from the US, he insists however, on his decision on the tariffs and states that they will not be abolished if Serbia does not recognize the independence of Kosovo. According to American diplomatic sources cited by the media in Serbia and Kosovo, in Washington they are outraged by the behavior of Haradinaj, as it spoils the US plans for a final agreement on the issue of Kosovo by the end of 2019. America’s nervousness intensifies, as Russia, following the loss of Montenegro and fYROMacedonia, is trying to set a strong footing in Serbia. State Department’s assessment of the situation that the political influence of Russia in Serbia will be significantly reduced if the Kosovo issue is resolved might prove fruitless, if Moscow penetrates in strategic sectors of the Serbian economy. In such a scenario, it would be difficult to free Serbia from the Russian “chariot”. With today’s visit by Russian President Vladimir Putin to Belgrade, it seems that Russia is trying to overturn Washington’s plans. One day before arriving in Belgrade, Putin, in an interview with Serbian newspapers Novosti and Politika, revealed that he is carrying a “strong” package of proposals in his luggage. Energy, infrastructure, preferential trade, technology cooperation were the issues Putin mentioned in his interview. The Russian president has promised Serbia not only energy security, but also a transit role in the transport of gas to Central Europe. He revealed that GazProm’s plans are to reach the South Stream pipeline through Serbia and Hungary to Austria, where there is a large gas distribution center to Central Europe. He said the Russian state railway company is ready to undertake the modernization of the rail network, while Russian construction companies will build highways. 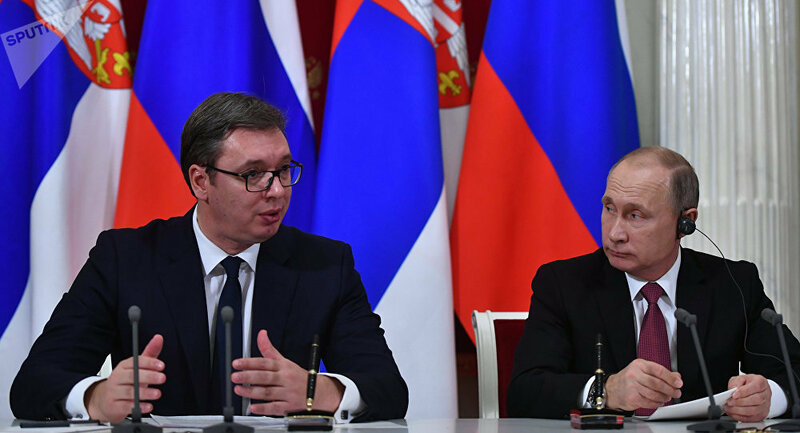 What’s more, Putin promised privileged regime for goods from Serbia to the Eurasian Union countries markets and emphasized the need for cooperation in developing new technologies.